It may still be cold out, but I keep on trying new cold and frosty treats with our ice cream maker. 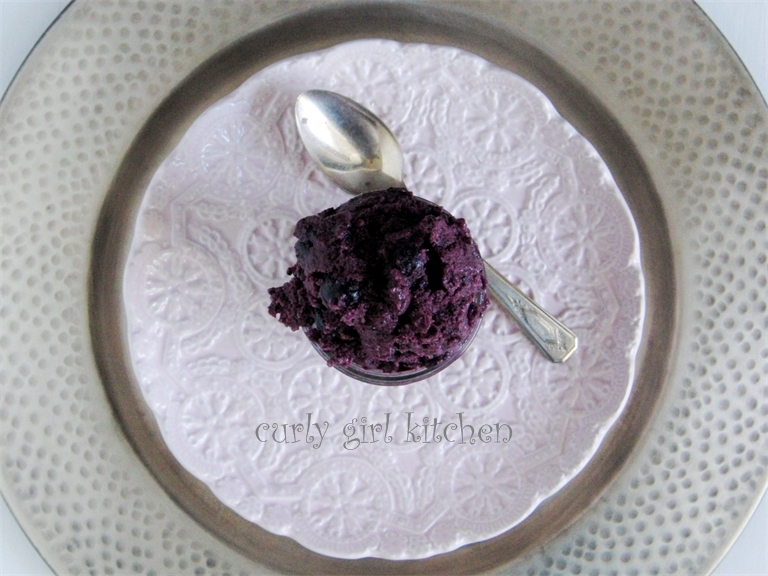 Healthy treats, too, as much as possible, like this Blueberry Frozen Yogurt Sorbet. 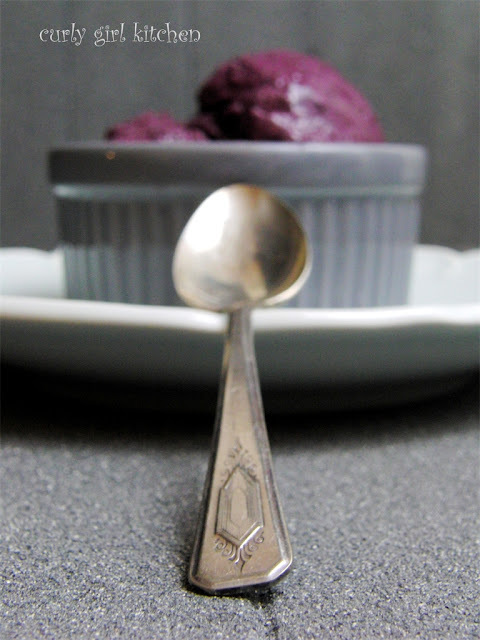 A sorbet is typically made from juice, with no dairy, while a frozen yogurt is more like ice cream. I am calling this a frozen yogurt sorbet since it's sort of a combination of both. Both are supposed to be creamy, although I'm a little stumped as to how to make a creamy frozen dessert that's also low-fat. Pretty much everything I've made in our ice cream maker that's milk-based, or with non-fat yogurt, tends toward icy-ness, in spite of taking it out of the freezer multiple times to beat down the icy edges. The cream-based ice creams I've made have been deliciously smooth and creamy. I have yet to make a custard-based ice cream, but am looking forward to trying that, too. 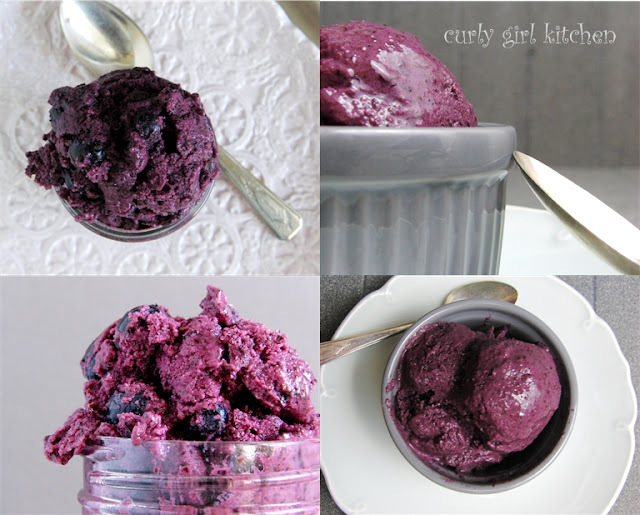 A lot of commercially available frozen yogurts really aren't any better than ice cream because of all the added sugar, but this frozen yogurt sorbet is full of health benefits from the blueberries and Greek yogurt, and low in both fat and sugar. I'll continue experimenting with the texture, and see if I can't make a frozen yogurt that's light, but with a smooth and creamy mouth feel, too! Curious to see if it would make a difference in the texture to strain the blueberry puree, I gave this recipe another try, and this time strained all the pulpy bits out of the puree. In the next photo, you can see that the two photos on the right are from the strained batch - it had a much smoother and creamier texture - and the photos on the left have the bits of blueberry pulp, giving it a chunkier, more rustic texture. Whether or not you take that step is really just up to your personal preference, but for myself, I far preferred the texture of the strained batch. As most sorbets tend to do, this freezes pretty solid, but scoops very easily if you let it thaw out for 30-40 minutes before serving. A little alcohol added to the mix would help as well. 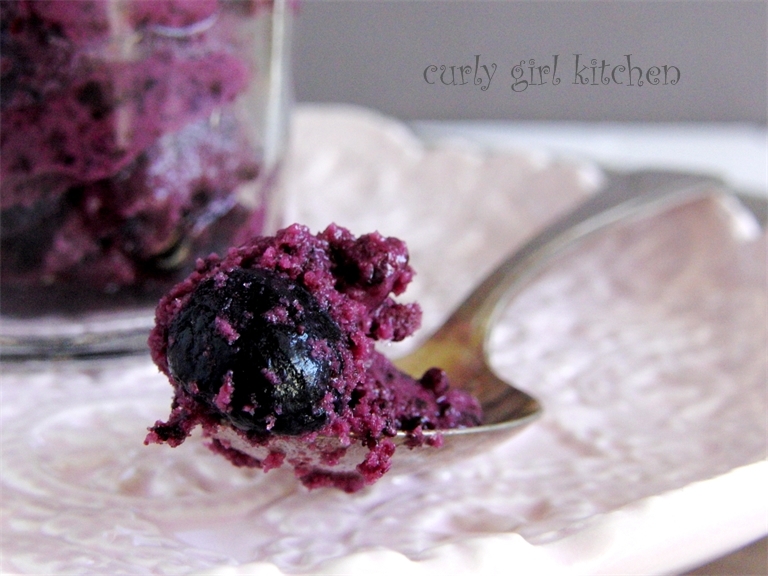 In a medium saucepan, combine the blueberries with the sugar and lemon juice. Simmer over medium low heat, until the berries thaw (if frozen) and start to release their juices and the sugar dissolves. Set aside to cool, then puree the sauce in the blender until smooth. 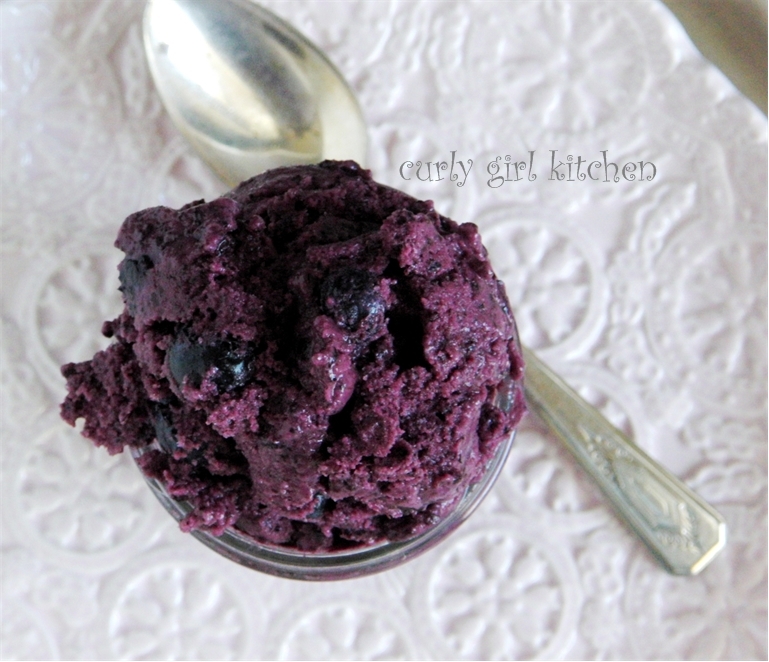 For a smoothier sorbet, pour the puree through a mesh strainer, using a spatula to push as much of the juice through as you can; discard the blueberry pulp left behind. Refrigerate overnight, or until thoroughly chilled. 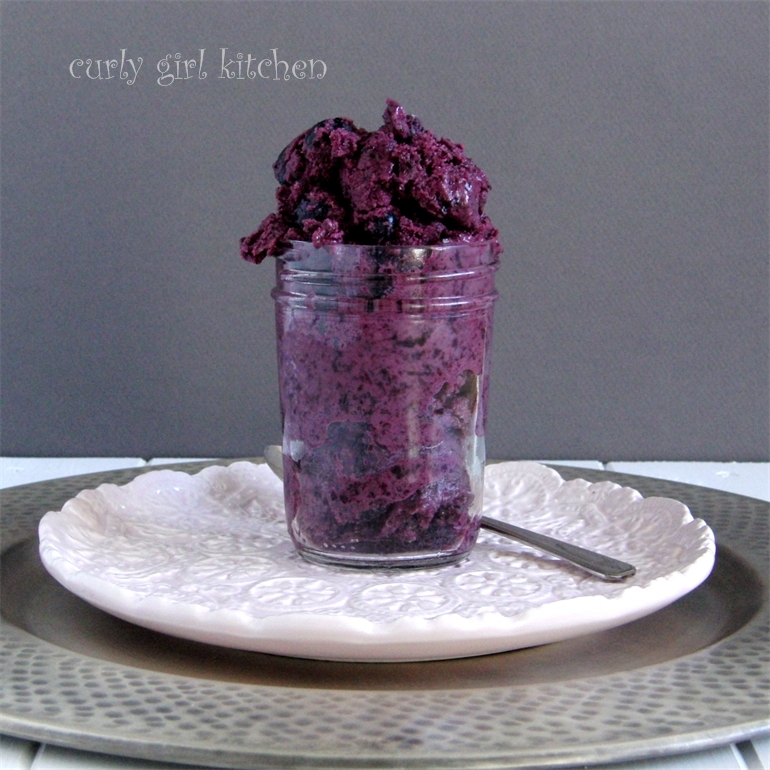 Whisk together the chilled blueberry sauce with the yogurt, milk and vanilla. Freeze according to your ice cream maker’s instructions. 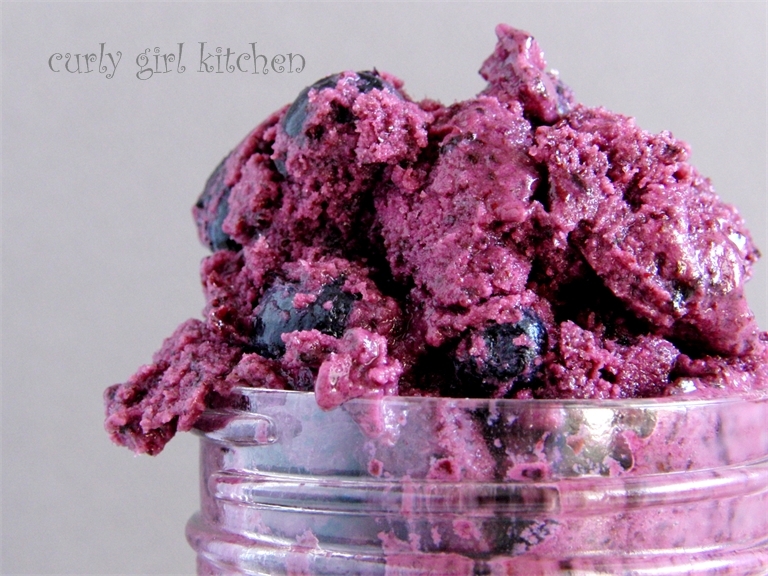 When mixture is frozen to soft-serve consistency, fold in the remaining 1 cup of blueberries. Transfer to a container and freeze until firm, 4-6 hours. When frozen for longer, the sorbet freezes pretty solid, but will soften up to a "scoopable" texture when left out to thaw for 30-40 minutes. Note, any form of berries or your favorite fruit such as cherries, peaches, mangos, etc, could be substituted for the blueberries. If using a seeded berry such as raspberries, I would suggest pushing the hot berry sauce through a mesh sieve to strain out the seeds, before chilling.